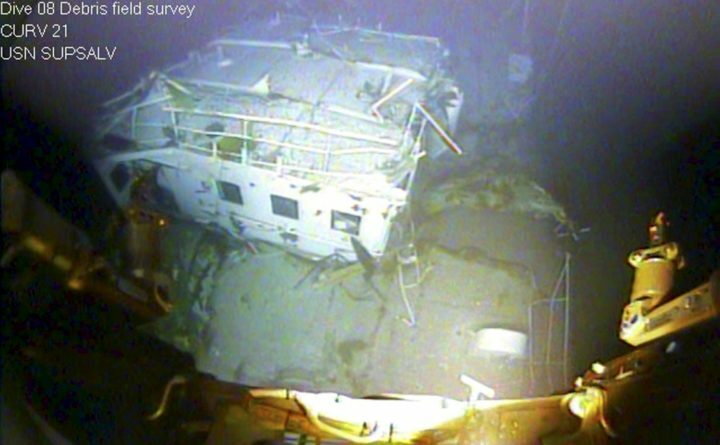 A closeup view of the El Faro navigation bridge is shown on the ocean floor taken by an underwater video camera Nov. 12, 2015. A series of safety failures from numerous individuals led to the sinking of the cargo ship El Faro and the deaths of all 33 crew members aboard during a hurricane near the Bahamas two years ago, according to a damning report from the U.S. Coast Guard. The Coast Guard report found safety failures on part of TOTE Maritime, the owner of El Faro, including inadequate lifeboats and training for crew, fatigue, and failure to notify the Coast Guard of repairs to the ship’s safety equipment and boiler system. The loss of El Faro on Oct. 1, 2015, has been deemed the worst cargo shipping disaster involving a U.S.-flagged vessel since 1983. Five of the crew, including Capt. Michael Davidson of Windham, graduated from Maine Maritime Academy in Castine. The four other crew members from MMA were Mitchell Kuflik, 26, of Brooklyn, N.Y., a 2011 graduate; Danielle Randolph, 34, of Rockland, a 2005 graduate and El Faro’s second mate; Michael Holland, 25, of Wilton, a 2012 graduate; and Dylan Meklin, 23, who graduated from Rockland High School in 2010 and from MMA in May 2015. Among other things, investigators found that TOTE and Davidson failed to gauge the intensity of Hurricane Joaquin and relied on outdated and inaccurate weather forecasts when the cargo ship sailed closer to the storm. Holland’s mother, Deb Roberts of Willis, said Sunday afternoon that the Coast Guard briefed her and other family members in Maine, Florida and elsewhere on the board’s findings on Saturday. She said the briefing in Maine took place at the Coast Guard’s facilities in South Portland. “They went over every detail and fact and recommendation. For me, what I got out of it was what I’ve been saying all along, that there wasn’t any one thing. It was many things, some small, some not, that combined together created this horrific tragedy,” she said. “I think that the Coast Guard has done a good job in their recommendations to move forward and put things in place to make life at sea for mariners a lot safer,” she said. She credited the Coast Guard for looking at what it could have done better to prevent the tragedy. Roberts thinks that some of those recommendations already have been adopted within the shipping industry. “It was a wakeup call for what can happen,” she said. Roberts hopes the El Faro disaster won’t deter young people from pursuing a career at sea. The report recommended civil penalties for four offenses, namely failure to comply with work-rest requirements; failure to comply with emergency procedures for special personnel; and failure to notify the Coast Guard and the American Bureau of Shipping of repairs to primary lifesaving equipment and to El Faro’s main propulsion boiler superheating piping made shortly before the doomed voyage. The report proposes more than 30 safety recommendations for future actions to the commandant of the Coast Guard. “The most important thing to remember is that 33 people lost their lives in this tragedy. If adopted, we believe the safety recommendations in our report will improve safety of life at sea,” said Coast Guard Capt. Jason Neubauer, chairman of the El Faro investigation board.